« Scrap your Car or Trade it in? Some of the country’s biggest trucks will make a triumphant return to Cheshire Showground in Knutsford on September 16th-17th for Truckfest North West 2017. The annual event is one of several to take place in regions of the UK, including the East of England, Scotland, the South East, the South and the South West & Wales, with further Truckfests at Peterborough and Newark too. A truck-themed itinerary spans everything from the newest models of HGV from major manufacturers, to celebrity guests from the worlds of television and trucking, to demonstrations by monster trucks and stunt drivers. Some of the familiar faces who will be meeting and greeting visitors, as well as co-hosting the action in the main arena, include Lisa Kelly and Todd Dewey of Ice Road Truckers fame, along with Jesse McClure from Storage Hunters. Terry Grant’s stunt man shenanigans will be one of the biggest draws in the main arena, along with the celebrity commentators mentioned above. His daredevil routine includes several eye-catching moments where Terry abandons control of his car completely to hang from the outside or throw his limbs out the windows. It’s a firm favourite with visitors of all ages, but definitely one of the most family friendly parts of the show, as younger petrolheads should be astounded by the death-defying stunts. Swamp Thing leads the monster truck charge at Truckfest North West 2017, and long-time fans of Swampy will already know it’s a truck with an impressive lineage. It originated in America as Dragon Slayer, and first came to the UK in 2000, when it had already been renamed Captain Insano. Further refurbs in 2002 and 2004-05 produced the truck known as Swamp Thing today, which driver Tony Dixon took to second place in the PROMT Championship in 2003, 05, 06 and 07 – earning him the nickname ‘Mr Consistency’. 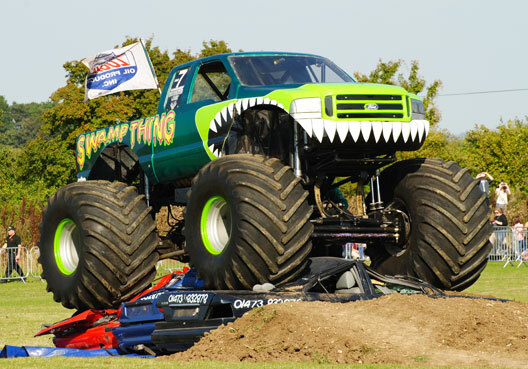 Since 2008 Swampy has increased the number of appearances at UK monster truck shows, with its alligator paint job becoming a familiar sight for enthusiasts. Truckfest North West 2017 tickets are on sale at advance prices until 9pm on Friday September 16th at £14 for adults, £6 for children, or £35 for two adults and two children aged 5-15. On the day, the prices go up slightly to £17 adults, £8 children and £45 for a family ticket – and these prices are for one day of either the Saturday or Sunday of Truckfest North West 2017. This article was posted in Truck Festivals. Bookmark the permalink. Follow comments with the RSS feed for this post.Both comments and trackbacks are closed.